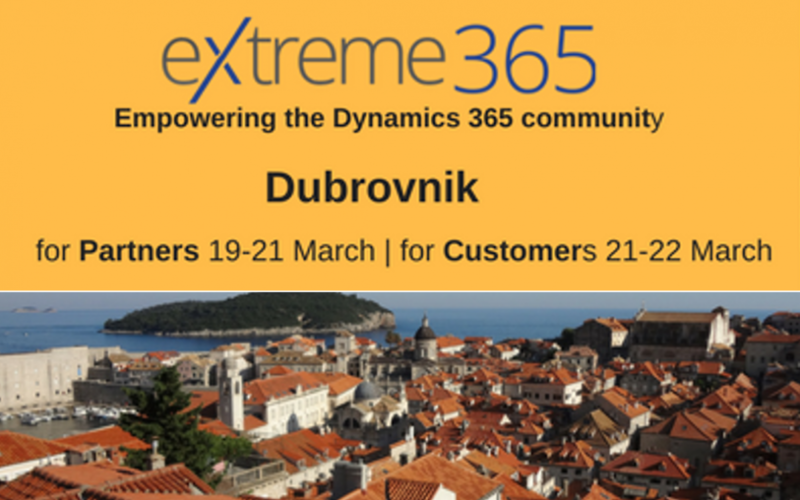 eXtreme365 is a great event for Dynamics partners and customers – massive Dynamics 365 education, networking, enormous drama with the weather and travel, and huge fun. Between March 18th and 22nd, nearly 1000 Dynamics consultants, partners and customers got together to enjoy a packed agenda in beautiful Dubrovnik, Croatia. The main focus for me at this year’s European eXtreme365 was enabling Digital Transformation. Combining the Microsoft stack of Dynamics 365, Office 365, Analytics, AI and Machine Learning allows Microsoft partners to uniquely differentiate themselves from their competition; their solutions can provide their customers with an advanced ability to evolve their businesses at great speed into areas of much higher profitability. eXtreme365 carried this message in a variety of ways: here’s a summary but we’ll be publishing more detail, and more links, over the next week or so – keep watch for more! After a mammoth 40 hour journey from Seattle – which showed her tremendous commitment and enormously impressed the whole partner community – Cecilia Flombaum delivered a great keynote with her customary full-on energy and humour. She and some key partners gave some great examples of how they grow their practices and create customer lifetime value. Mike covered what Dynamics 365 means to the market at a strategic level and how Microsoft is changing the game in business applications. One key focus was on embedded BI within Dynamics. As Mike said, people don’t buy Dynamics so they can put data in; they buy it so they can get insight out. More here. Significant update to the Common Data Service for Apps that ships with PowerApps enabling a broad set of capabilities for modeling sophisticated business solutions. More info available at the Business Forward live site. Growing the Dynamics365 Talent Pool globally from 365 Talent Portal ’s Elena Baeva, with a great case study from eBECS’s Stephen Wilson, Lyndsey Coupe and Andy Brooks. Glass ceilings – are these real, and imposed on women or perhaps do some women impose them on themselves? Confidence in applying for jobs – many women feel they need to tick 100% of job description criteria before they are comfortable to apply, but perhaps some men just apply even though they can only realistically tick less than half. Is this a true divide of the sexes or is it simply a matter of individual confidence? There were lots of focussed sessions on Dynamics 365 product functionality, technical instruction, how to build and run a successful Dynamics practice, how to integrate without code, where to find online Dynamics information sources, and how customers can work better with partners for project success, plus too many others to mention in this summary, but details are here. And of course, some superb parties, great fun, and excellent networking….. Can’t wait for the next one.